Intruder alarms 11 November 2017 y. At the beginning of 2017, we have released a new generation of intruder alarm systems – ORION NOVA. This system has become a platform for the introduction of modern technologies and services that have long been demanded by the market. Orion NOVA brings new approaches and benefits to users of all levels, from installer to end-user. The important this is that Orion NOVA series continues to develop. The second release of ORION NOVA 4/8/16 (v1.2.1) is currently on sale, it implements most of the wishes of our customers who have tried the first version of the equipment. Here we remind you about what is ORION NOVA, show new features of the second release and also the prospects of this series. So, ORION NOVA is a series of professional security systems for various types and sizes of objects, from apartment to office or shopping mall. At present, ORION NOVA series is represented by four basic alarm control panels and a wide range of additional equipment: keypads, communicators, expansion modules, etc. New software products are also included in the system both for system installers and for end users. The list of ORION NOVA equipment, in fact, enables flexible adaptation of the security system to the requirements of a specific object and its users. Now we consider in detail this series on an example of the main control panel – ORION NOVA 8. Although it looks just like the old control panel, Orion-8T.3.2, but there is a lot of interesting inside. The heart of the system is a powerful microcontroller with ARM architecture for immediate system response. Modern GSM-module for connection of the device with the outer world. 2 relays for automation control. 2 RS-485 system buses for the connection of keypads and additional equipment. 2 outputs for the connection of confirmation LEDs. 1 output for connection of siren. 1 universal output for the connection of the second siren or any other automatics. Touch memory interface for the connection of TM key readers. USB interface for system setup. The connector for expansion of zones. The connector for Ethernet communicator. A special attention has to be paid to terminal blocks, now they are more reliable and convenient. As for the basic system parameters, they are as follows: device supports expansion to 64 signalling zones, up to 32 outputs, 16 groups and 16 users. It is possible to connect up to 8 expansion modules and up to 4 keypads of any type. These parameters are for the second release of ORION NOVA control panels, starting from version 1.2.1. (devices, that were previously installed may be updated to a new version). The first three of those are LED keypads: K-LED4, K-LED8, K-LED16 with LED display. They are the simplest and the most affordable. The next keypad is a functional one, equipped with LCD-display – K-LCD. It allows you to see additional information on a display and perform a wide range of functions: separate arming and disarming of groups, perform system administration and event logging, and lots of more things. User actions are accompanied by on-screen prompts, which greatly simplifies the system control process. And, of course, K-GLCD keypad, white and black, a combination of functionality, technology and design. The faceplate made of tempered glass, OLED screen, and Smart Light system make it a real decoration of the security system. The keypads have changed not only their appearance; there is a lot of interesting inside. All keypads except for K-LED4 have 2 on-board alarm zones, programmable output and Touch Memory interface (except for K-GLCD). As you probably know, the basis of any security system is the protection of entrance group – it can be either an entrance door, or a corridor. Since in most cases a keypad is installed at the front door its zones can be used for connection of detectors, which protect the entrance group. This eliminates the need for the connection lines with a control panel for these detectors, which allows saving cable products and improve the topology of the system. When using zones in keypads, a control panel is connected to a keypad with the RS-485 line (up to 1000 m) and a power line (possibly with one cable), and lines connecting the entrance detectors are wired to a keypad. Programmable transistor output on keypads can be used, for example, for connection of a confirmation LED or electric lock control. The Touch Memory interface allows you to connect a key reader directly to the keypad. This is useful for a typical protection of small offices or stores with vestibules. A keypad in such objects can be located inside the premise, and the key reader is in the vestibule or outside the premise. We should also mention the terminal blocks on the keypads, they have significantly changed and are now self-locking. At first glance, and even during the first installation, it may seem that the previously used terminal blocks were more comfortable. But this is only at first glance :). After installing several keypads it becomes clear that new terminal blocks allow you to connect, firstly, faster, and secondly, more reliable. Faster connection is due to the fact you do not have to twist and untwist a screw, a wire is simply inserted into the block; increased reliability is because the force of contact of a block and a wire does not decrease over time, but only increases, as the self-clamping mechanism works with the help of a spring. It's worth noting that all control panels of the Orion NOVA series support all types of keypads! There is a number of additional devices and modules in the Orion NOVA system, allowing constructing a system as a designer – design the required number of zones, outputs, inputs, access identifiers, etc. M-Z module – is a module for system expansion by 8 signalling zones. The module is installed on the primary PCB of any control panel of ORION NOVA series or M-ZP box module and, provides additional 8 signalling zones to a system. M-ZP box is a module for expansion of zones and outputs of the system. It has 8 basic signalling zones, 4 transistor outputs, an output for siren and touch memory interface. Additional M-Z module can be installed on the PCB of M-ZP box, so it provides additional 16 signalling zones. M-ZP box is located in our standard plastic case and has a power supply and a battery of 7Ah. It is connected to the control panel, like all other devices, via the RS-485 system bus. M-OUT8R is an expansion module, providing extra relay outputs. It gives 8 powerful relays to control automation, for example, heating, air conditioning, light, etc. In combination with the automation scenarios system, it is possible to implement the basic functions of a "Smart House", like to turn on a light when a system is armed, or to lock the electric lock at arming, turning on the heating when receiving a signal from the thermostat, and many others. M-WRL is a module for connection of wireless components to the system. Up to date, the modification of M-WRL supports the work with wireless components made by Crow, the support of other devices is being implemented. P-IND32 is the remote indication panel. It is supported only by ORION NOVA 8+ control panel. It is used at medium and large objects, which require a simple and clear indication of the state of the system. M-NET is a communicator intended to work with a central monitoring station and a cloud server of Tiras LTD via the Ethernet channel. This module is supported by all control panels of Orion NOVA series. Ethernet channel is becoming more and more popular with the increase of Internet traffic in security systems, due to remote control, increase of the information content of communication protocols with the central monitoring station, reduction of the time of the system survey, etc. In order to minimize the cost of the Internet, one should use the Ethernet connection as the main communication channel, and GSM channel as a backup one. M-GSM – is a communicator working with central monitoring stations and cloud-based Tiras CLOUD server via the GPRS channel (for ORION NOVA 8+ control panel, all the other ORION NOVA control panels have a built-in GSM-communicator). GPRS and Ethernet communication channels are used for communication with the central monitoring station. NOVA and INTEGRAL FIRE protocols are used for operation with MOST and SPIDER central monitoring stations, respectively. The modification of control panels of the ORION NOVA intended to work with SPIDER central monitoring station is at the final stage of development and will be available for sale soon. GPRS and Ethernet communication channels can also be used for communication with the cloud-based Tiras CLOUD server. ORION NOVA is a universal security system that can work both in stand-alone mode and in connection with a central monitoring station. The change of the operating mode does not require replacement of the device, but only a resetting. Thus, the object owner may first use his/her control panel in stand-alone mode, and then if necessary, conclude an Agreement with a security company and connect it to a central monitoring station. 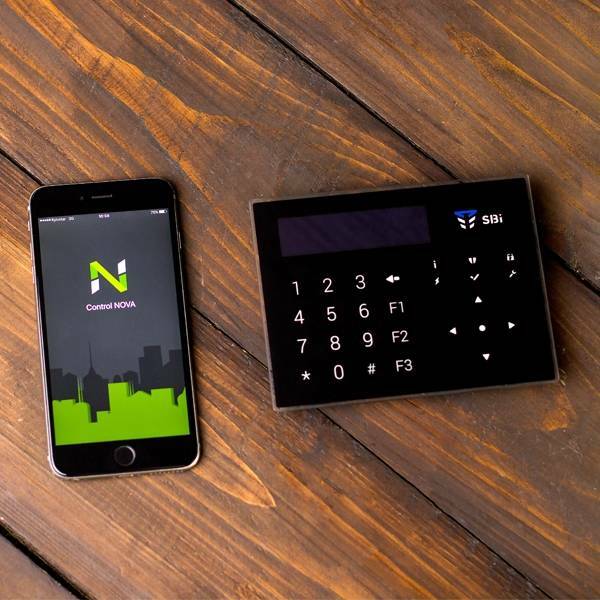 Now the system can be controlled not only from the keypad, key or access card but also from a smartphone. To this end, a special application, CONTROL NOVA was developed. CONTROL NOVA provides the possibility of full remote control and monitoring of the state of the system: arming and disarming, control of outputs, event log, review the current status and all these services are online. The connection between the basic signalling device and the client’s application is via the Tiras CLOUD cloud server. The connection is protected, according to the current standards of encryption, the access to the application is protected by an access code or a fingerprint. You can download Control NOVA app for free both for Android and iOS OS. Let's now turn to setting process. The system can be completely setup with the use of the specialized oLoader app, which now exists for both Windows and Android. Now you do not need any USB programmers, the built-in USB interface allows working directly with the device. What is needed to set up the system? Only a typical USB-mini-USB cable is required for setup from Windows OS, while the Android-setup requires only a USB-OTG cable. Almost all the users of electronic devices have these cables at home. ORION NOVA is a professional security system developed in accordance with the European standard DSTU EN50131 with the GRADE 2 protection level and is ready to stand against not only casual inexperienced thieves, but also experienced "specialists" with special equipment. By default, the system works according to this standard, it does not show the system status in the standby mode, and sends no more than 5 messages of the same type to the central monitoring station, switches off the confirmation KED in 180 seconds, etc. But all the working algorithms can be flexibly set and configured, similar to that of control panels of ORION-T.3.2 series.